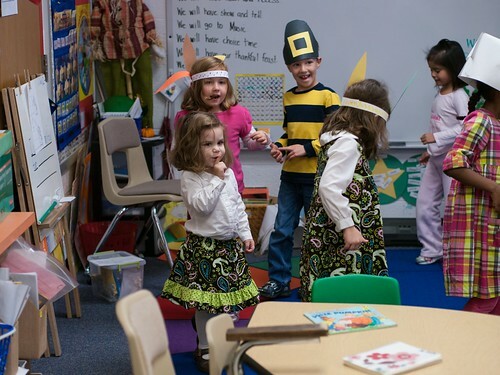 The kindergarten classes at Molly's school have a Thankful Feast every year which they invite their families to come to school for. There was a good turnout, including our whole family. 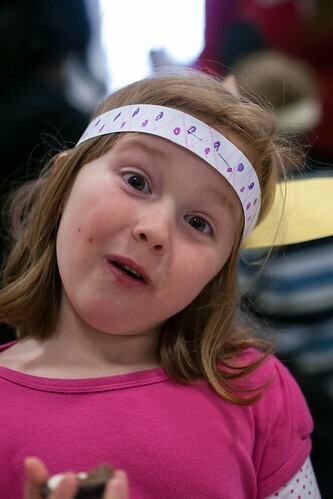 Molly's friend Catherine - not sure what this expression was. 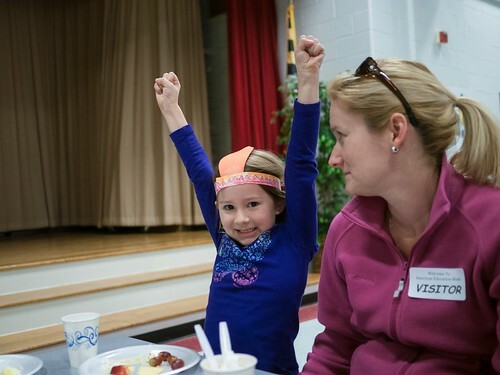 Kaylin's giving three cheers for the Thankful Feast! 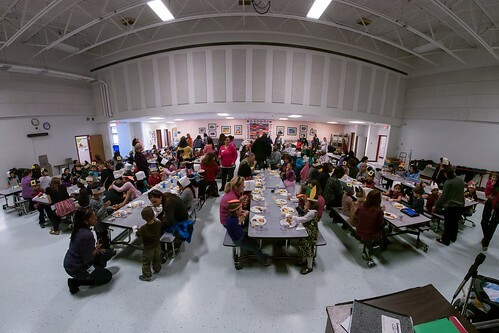 After the feast, the kids went back to class for 30 minutes. We were invited to stay if we liked. Leah immediately jumped into the class (Ms. Colella said it was ok). 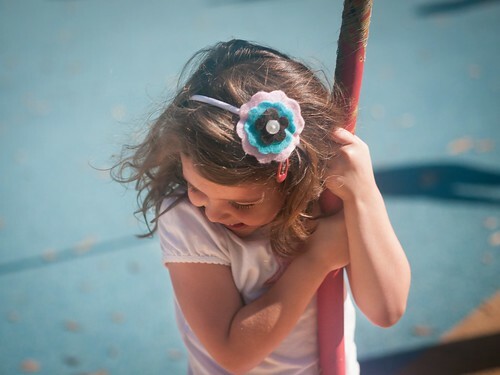 Here she is dancing around the circle, loving being a kindergartner for a few minutes. 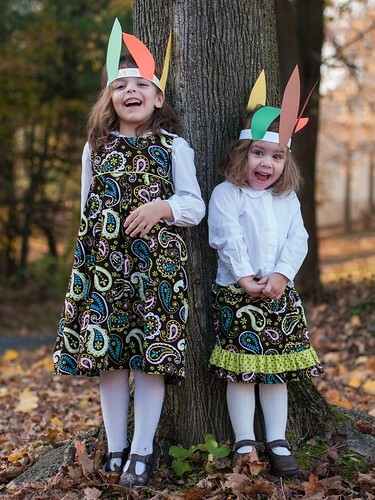 I had made the girls new Fall outfits earlier in the week, which they requested to wear to the Thankful Feast. Molly's Music box jumper was my first Oliver + S pattern. 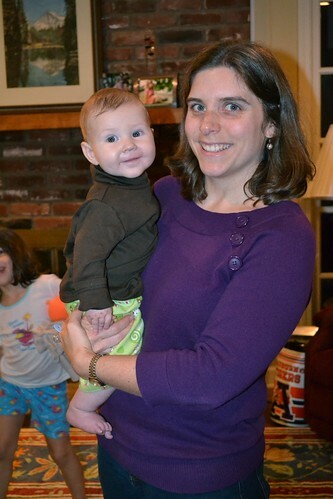 Leah's skort was the same Isabella pattern I made for her birthday. She loves the shorts underneath! Molly and her choir at church sang three songs this Sunday. Can you tell which one the kids have the most fun singing? 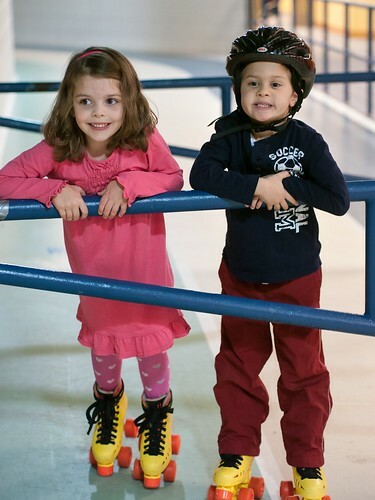 Molly was requesting to go roller skating. So I called up some friends and we all headed to the Skate Arena. 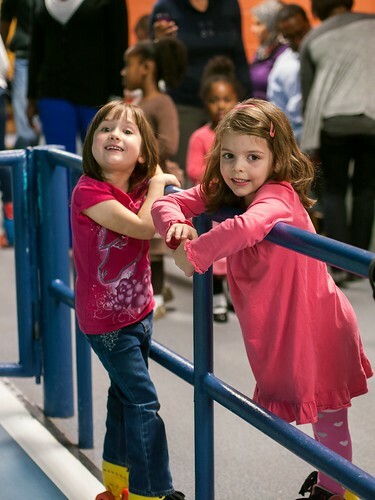 Allison & Molly had fun hanging out and hanging on railings and walls. 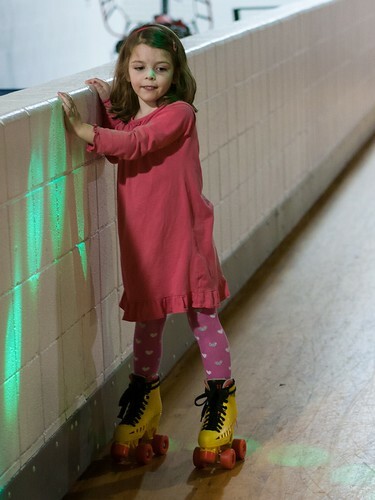 Matilda had a harder time getting the hang of skating, as did her mom! 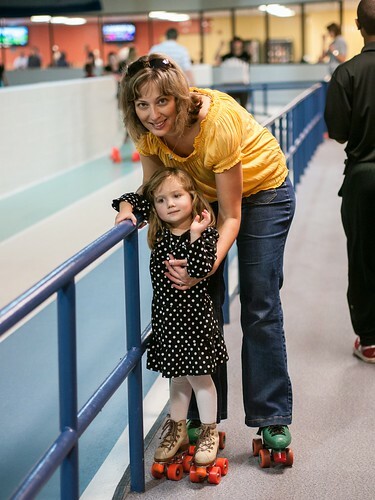 The skating rink (also known as the arena at our local gym) uses a section of the indoor track as a practice lane. Simon was doing a great job with his dad. Jake showed up with his bike helmet and was ready to go! 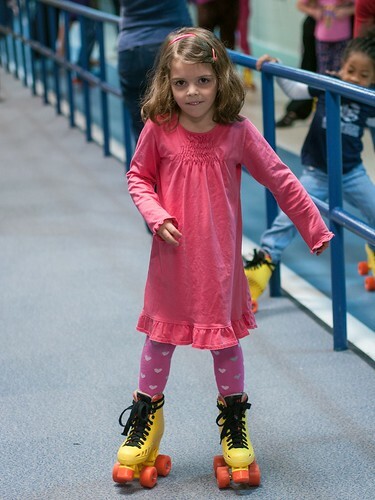 Molly eventually realized that she could skate better on the carpet, rather than in the rink. 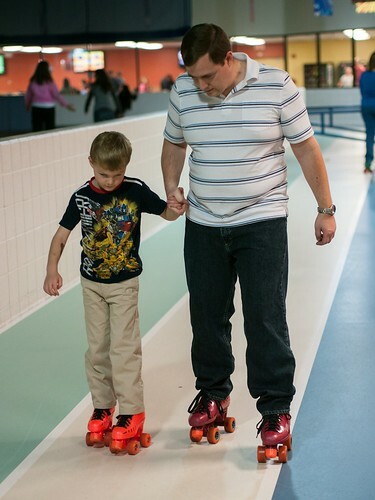 All the kids had fun, so we'll definitely try it out again. G'Mom's birthday is later this month, so we had an early birthday celebration. Chad was impressed with my fast baking skills when I decided to whip up some cupcakes during nap time and they were baked and decorated in 1.5 hours. 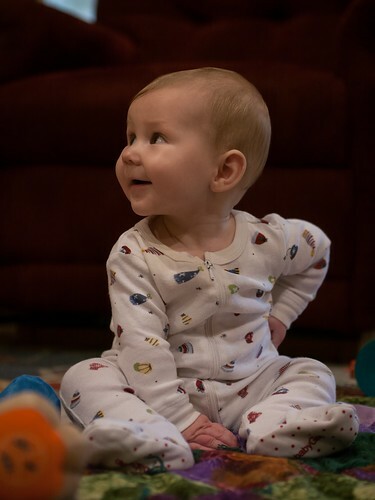 JJ sure likes hanging out with Aunt Jen - especially when he's wearing the snazzy pajama pants I made for him. 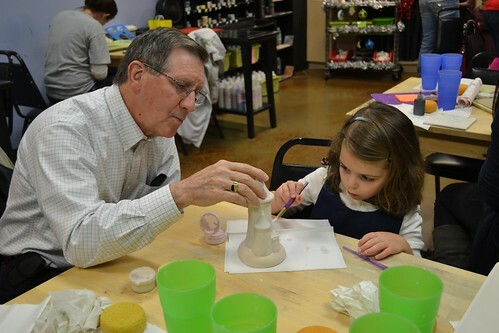 We also checked out the excellent Children's Museum of Memphis while we were there. It has a a tons of fun stuff for kids, including the cockpit of this FedEx jet that Leah is flying for us. 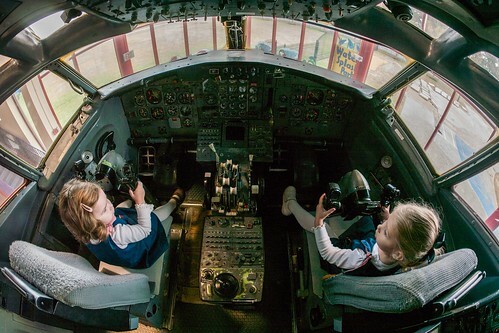 Leah and Emmie are ready to fly this jet wherever we need to go. 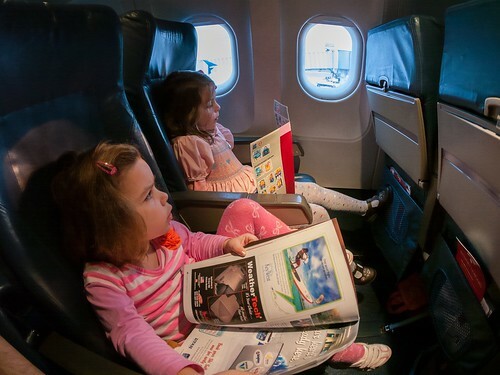 Emmie said we were going to New York, though Molly radioed from flight traffic control saying we were supposed to go to South America. 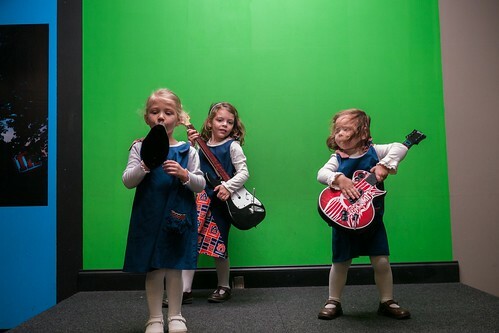 The museum has two areas with green screens where they show the kids on TV screens superimposed over some other video feed. The band here is rocking on the beach to Surfin' Safari. 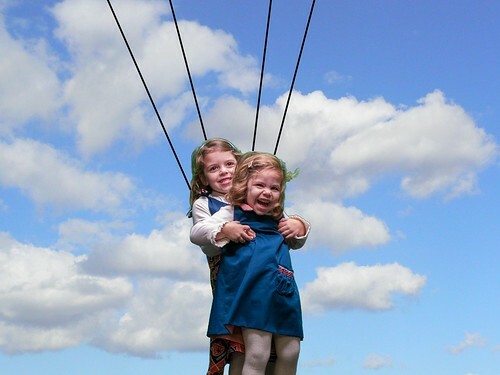 Molly and Leah decided to soar through the sky a bit as well. We also played at the toy river they had set up. 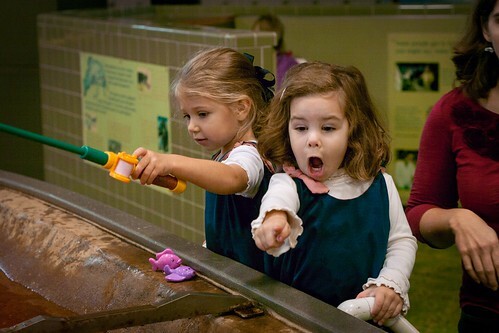 Apparently, the little toy shark is very exciting. We visited Grampa at his office before having lunch at the Bar-B-Q Shop (which was outstanding). The girls wanted to go to Grampa's office so they could draw on the whiteboard. 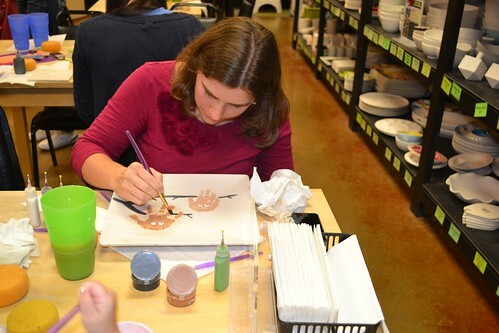 G'Mom and Grampa took us to paint pottery on Monday night. Molly saw this castle piggy bank and fell in love with it. Now she says she needs some money to put inside! 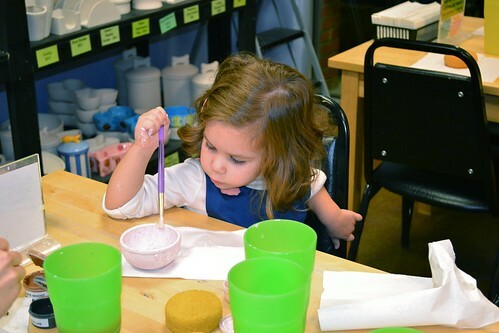 Leah painted herself the perfect sized ice cream bowl. We had a great weekend all together, but we did miss Uncle J who was on a mission trip in South Sudan. 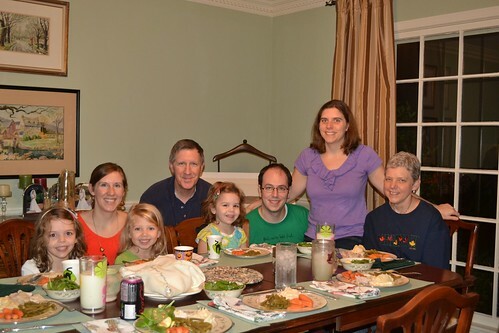 On our way home from the airport, we stopped for dinner with Aunt EA and Scott to avoid rush hour traffic. If you are local, you must check out Cheesetique in Arlington. Mmmm, it was so good! Our county uses schools as polling centers, so Molly was off of school Monday and Tuesday for the election. We took the opportunity to fly to Memphis to visit with my family. Leah was thrilled to sit in the seat like Molly and we were excited to not have to carry her carseat through the airport! G'Mom and Grampa took us to a giant county park near their house. 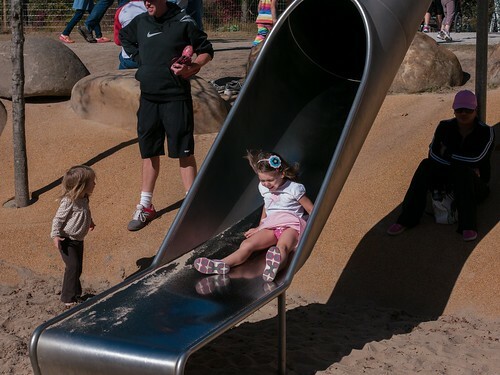 It has a spectacular playground, including this extremely tall and fast slide. 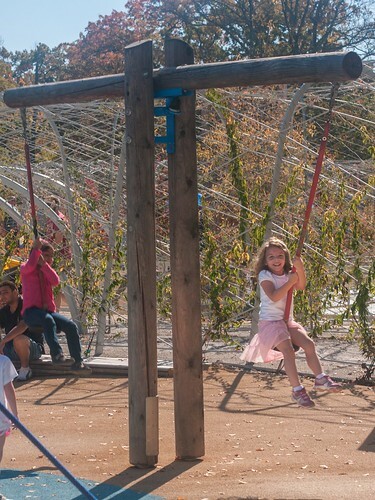 Molly's favorite part of the playground was this teeter totter. 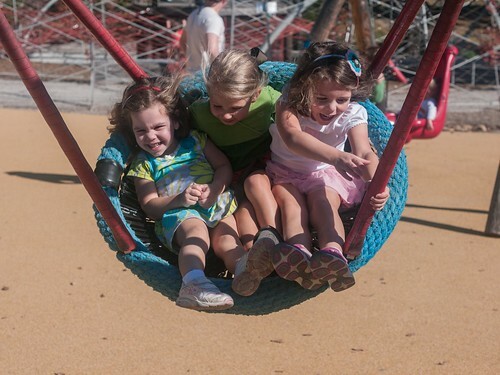 The girls had fun all together on this basket swing. Emmie must have thought that G'Mom and Grampa's house was really frigid! 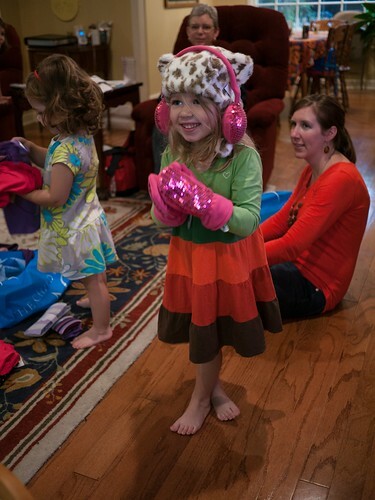 Or it may have been that she was excited about her new gifts from G'Mom. 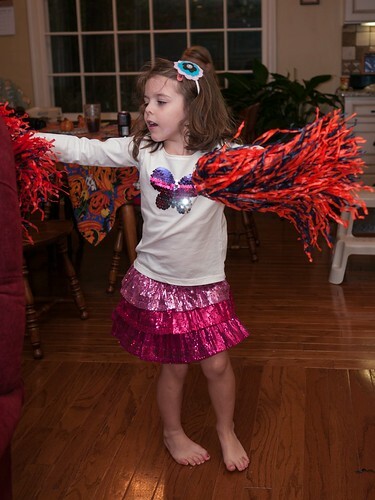 Molly loved her new sparkly clothes so much that she decided to cheer about them! JJ was happy to watch all the dancing and cheering! I couldn't resist making JJ a fleece monster hat. He'll be sporting a super fun hat this winter. 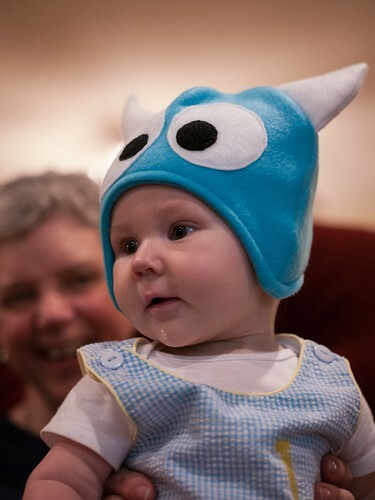 Emmie was the recipient of a cute monster hat too. She was also excited to model her new cherry corduroy jumper. 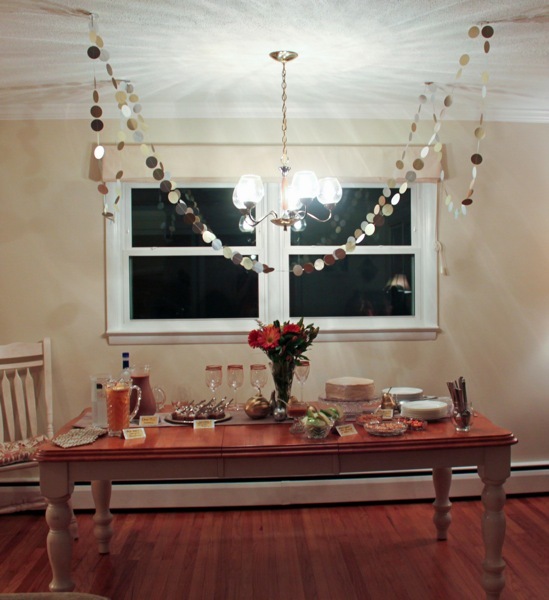 Saturday night we had an early Thanksgiving dinner. 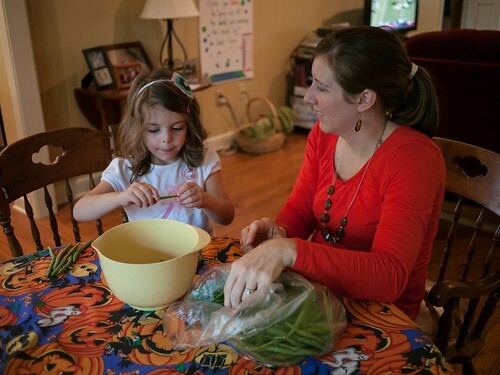 In preparation, Aunt 'Chelle needed to snap the green beans, so she enlisted some extra help. You can never get enough holiday food, right? 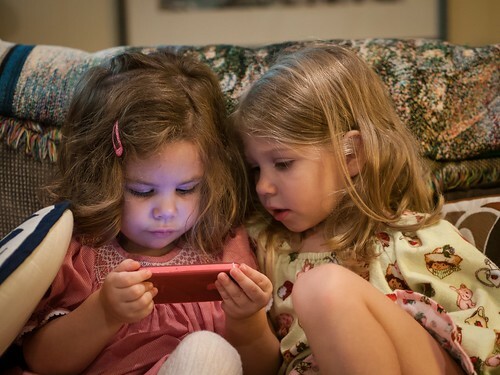 The girls all enjoyed playing games together on any available iOS device. They were even seen playing old school board games! 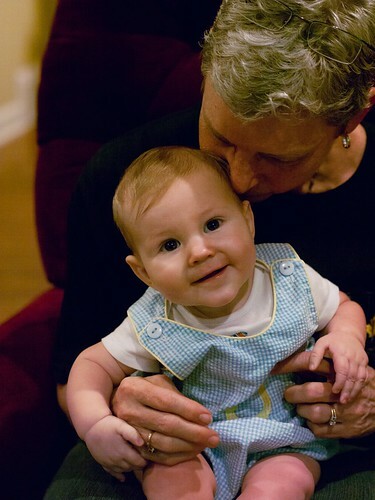 JJ was sick over the weekend, but he did have some smiley moments. 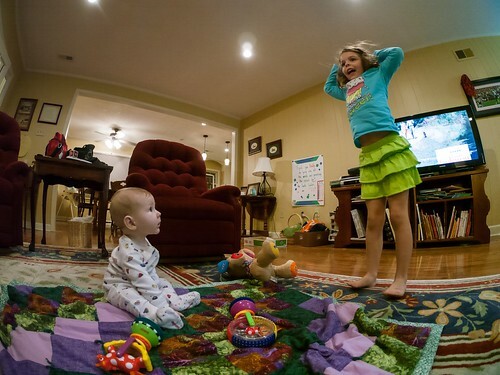 Molly found that JJ's puppy played Head, Shoulders, Knees & Toes, so she spent one afternoon trying to teach him all the moves. He was very entertained! 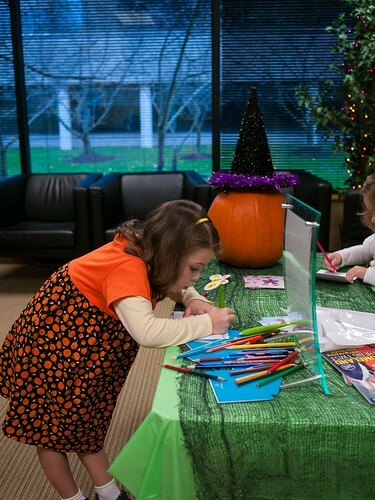 As we did last year, the girls participated in the Halloween candy buy-back program at our dentist office. 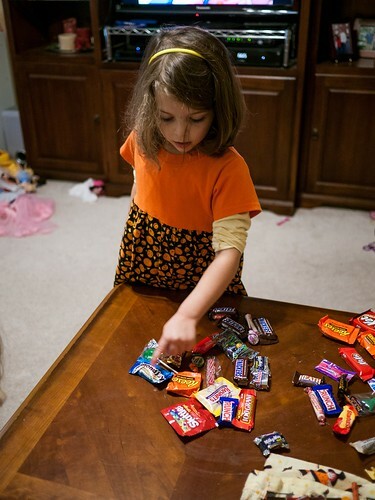 The girls were told that they could each keep 15 pieces of candy. Molly made sure to count her 15 pieces, as well as the pieces that she was going to donate. 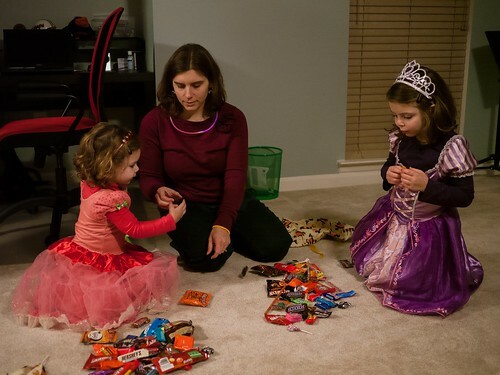 Ms. Melissa helped the girls weigh their candy and rewarded them with a thank-you goody bag and $1 coin. 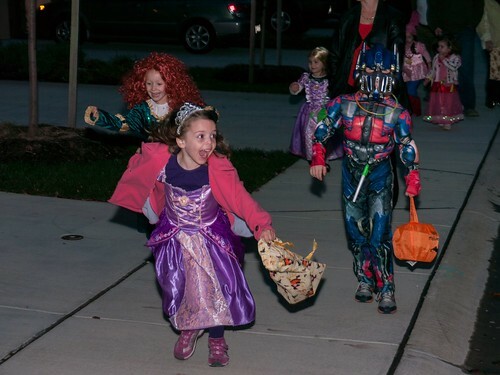 When I asked the girls if they wanted to donate part of their candy again, Molly was most excited about the goody bag! 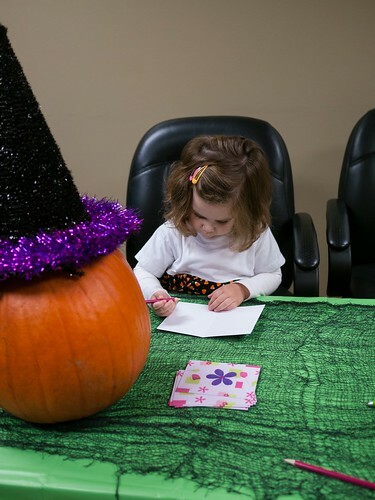 Dodek Dental also set up a table to draw thank you cards to be included with the candy. 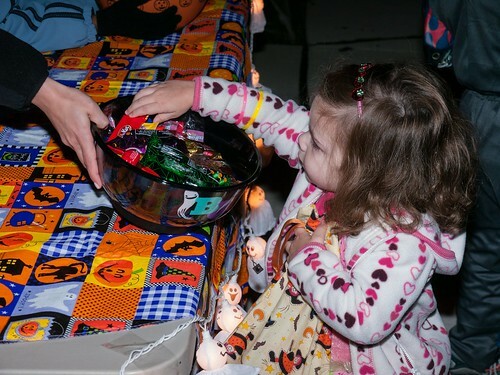 The donated candy will be part of Operation Gratitude's care packages sent to deployed US Military. Molly was very intent on getting her card just right for the soldiers. I was all set to help host a baby shower for Christy last weekend when we realized that we'd be in Memphis visiting my parents. So, I volunteered to help with a few of the decorations. 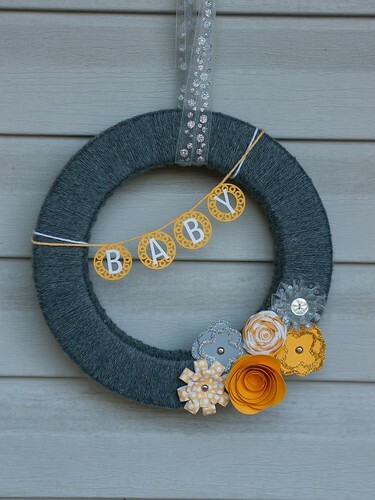 I made a wreath for the front door at the shower, inspired by this wreath. 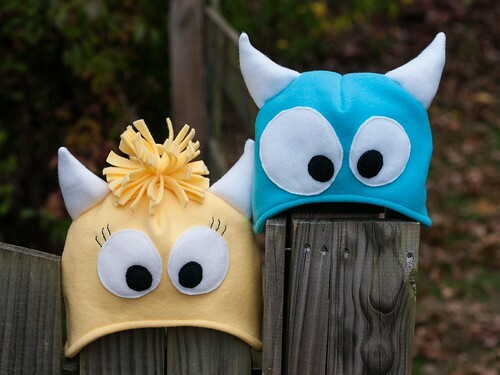 When I saw these monster hats, I bookmarked the page to make them later, but then I decided that they were so cute that JJ had to have one. 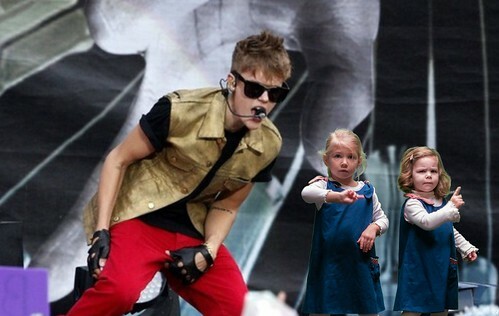 And Emmie needed one too, right?! Now Molly and Leah are asking for monster hats. My mom's birthday is later this month, so my sister and I decided to make her a variety of Christmas ornaments. I was excited to play with vinyl on my Silhouette for this project. 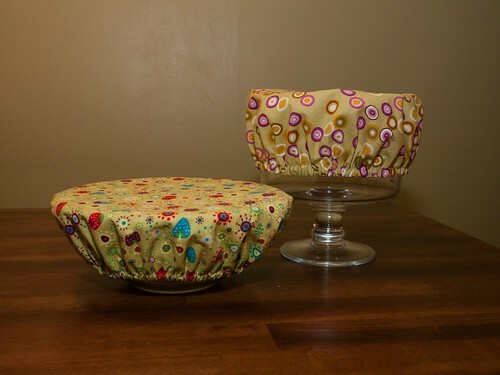 I also made reusable bowl covers for her. 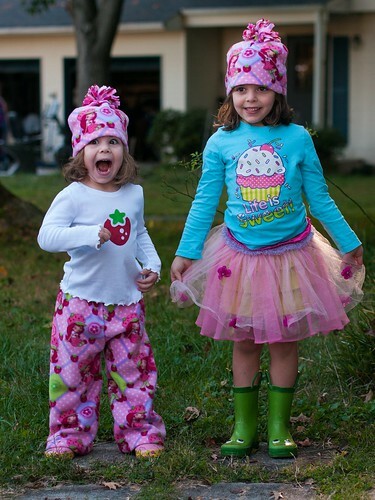 In early October, I again participated in the Kids Clothes Week Challenge. 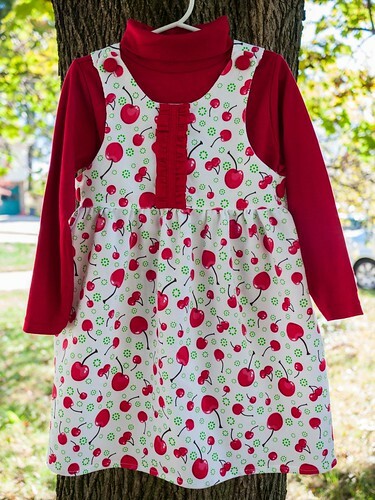 The challenge was to spend an hour a day for seven days working on kids clothing. 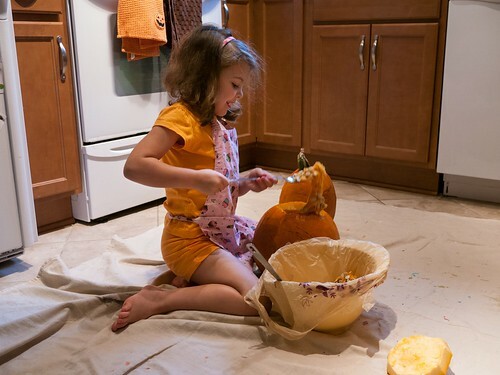 It could be time spent cutting patterns and fabric or sitting at the sewing machine. During the week, I worked on several things for my girls, my niece and nephew, and a baby gift. Chad called it my "crazy week of sewing" since I couldn't just spend an hour a day sewing when I was in the middle of a project. My mom had given me the leftover fabric from making this blanket and pillow for Leah, so I made jammies to match. 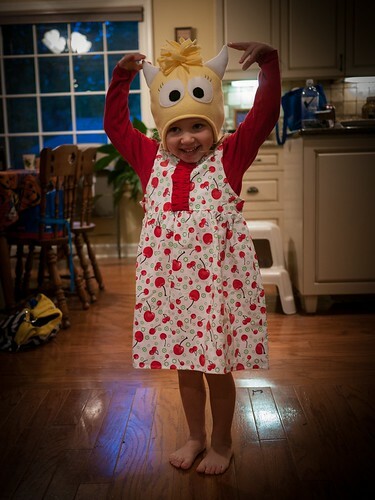 Leah might be a tad excited about her hat too! Emmie was the lucky recipient of this corduroy Tianna dress. I was finally able to give it to her this weekend as an early Christmas gift. 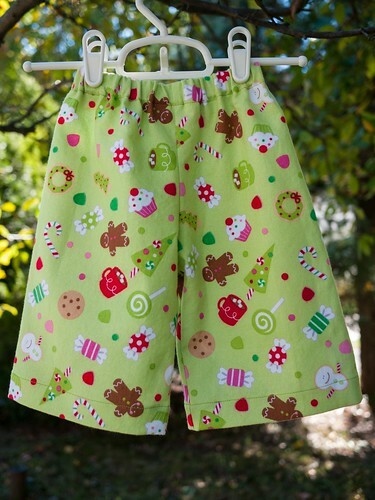 Michelle also asked me to make jammie pants for JJ to match Emmie's Christmas nightgown. They are the tiniest little pants. 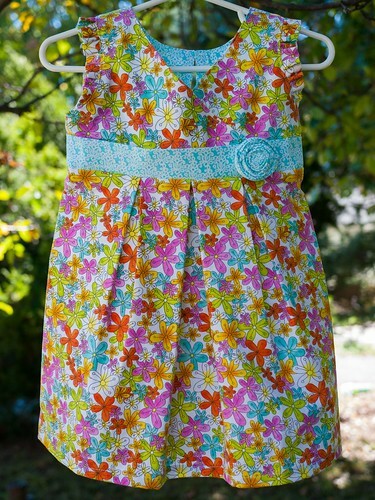 My last project was this Katelin dress, a long awaited shower gift for Eric and Christy. 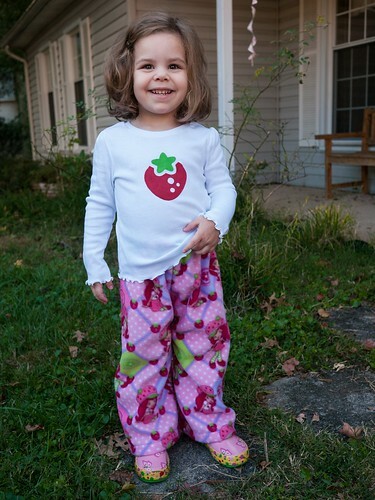 We are so thrilled that a little girl will be joining their family in December! 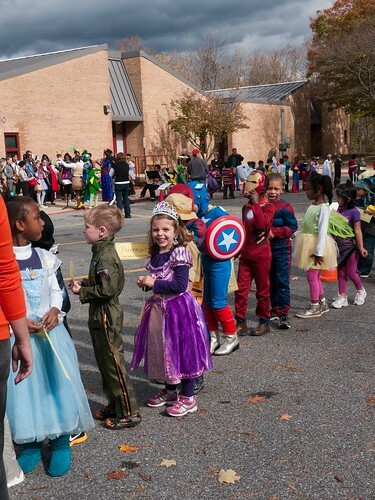 Molly's school had a Parade of Words for the kids on Halloween day. 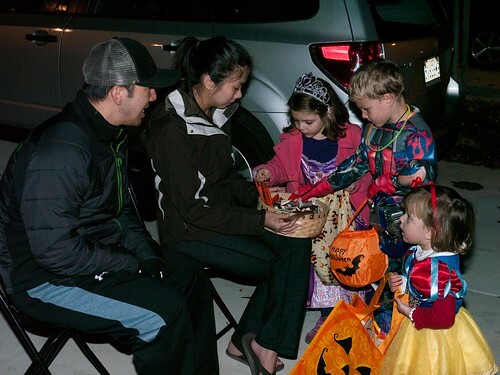 Each child was asked to describe their costume with a specific word. Kindergarteners described with nouns. Other grades described their costumes with adjectives, adverbs, verbs and phrases. 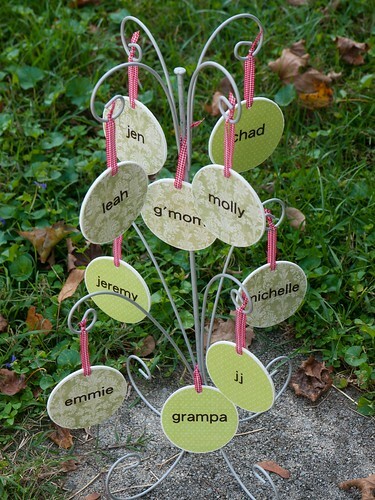 It was a creative way to add a little education into the holiday festivities. 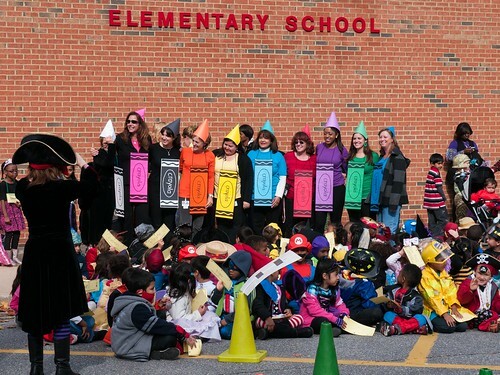 The kindergarten team dressed up as a box of crayons. What's your favorite color? Ours is orange! Yay Ms. Colella! 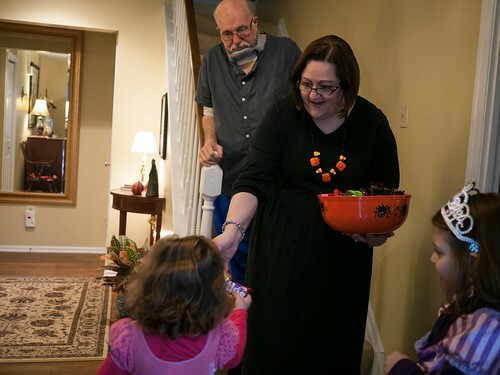 As always, our first stop is to Trick-or-Treat at Grams and Pop's house. The girls love the full size candy bars there. 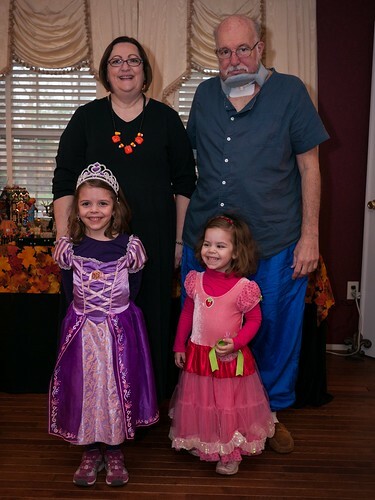 The girls were happy to take a picture with Grams and Pop before heading on to Keira and Maya's neighborhood for Trick-or-Treating. 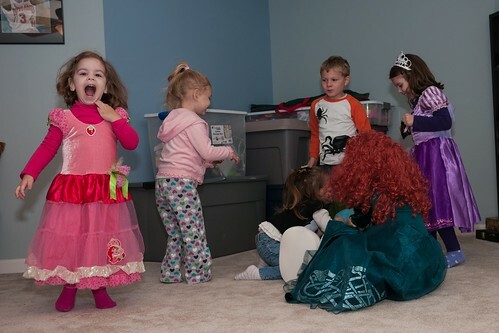 Molly is Rapunzel and Leah is Strawberry Shortcake. 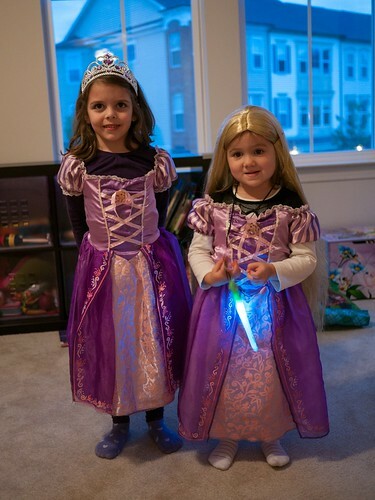 Molly and Matilda were both Rapunzel from the movie Tangled. Note the important difference though. 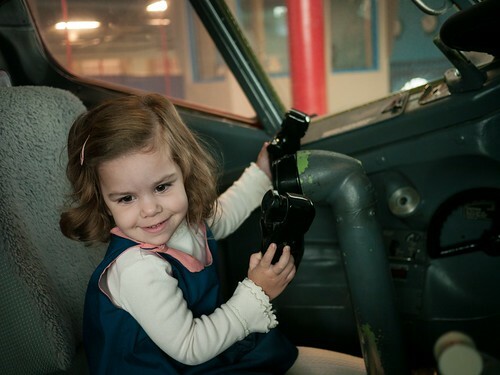 Molly will quickly point out that she is Rapunzel from the end of the movie (when her hair is short and brown), while Matilda is from earlier in the movie when she still has very long blonde hair. 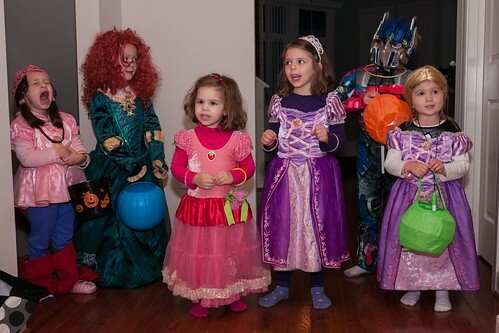 Rapunzels are joined by Merida and Strawberry Shortcake (who's not technically a princess, but pretends to be one when she wears the crown Leah has on). Add in Izzy and Optimus Prime, and we've got the whole gang. I think they may be excited to get started. Molly and Simon were typically out front. We had to keep slowing them down so the others could keep up. 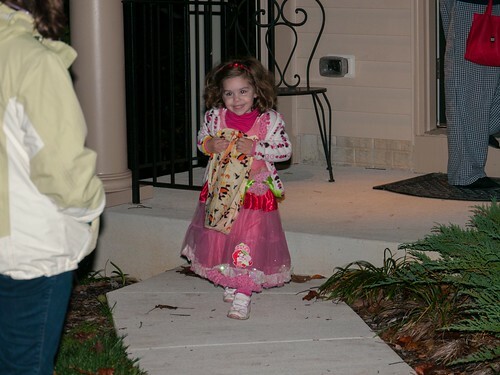 Leah definitely liked getting some candy. 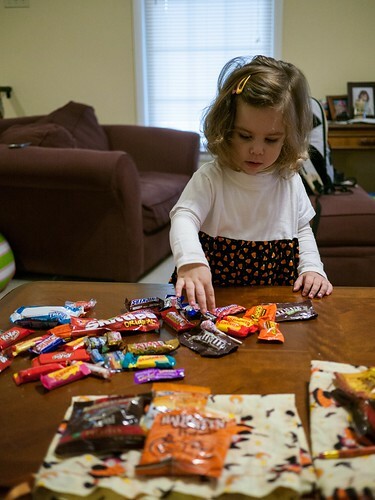 Leah took her time to pick out exactly the piece of candy she wanted at each house, which often meant she was struggling to keep up with the bigger kids who'd grab and go. Of course, every now and then you need to inspect your loot! Back at Keira and Maya's house, the girls inspected what they received and picked out 2 pieces of candy to eat that night. 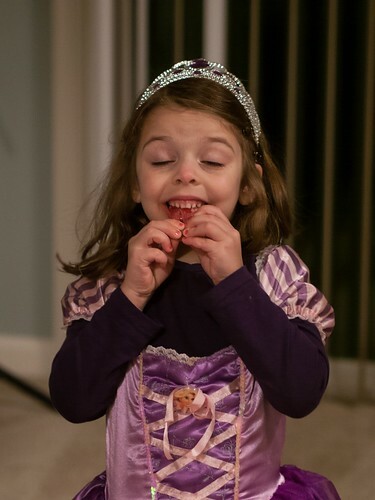 Molly chose this huge gummy Lifesaver, but had a bit of trouble actually biting through it. 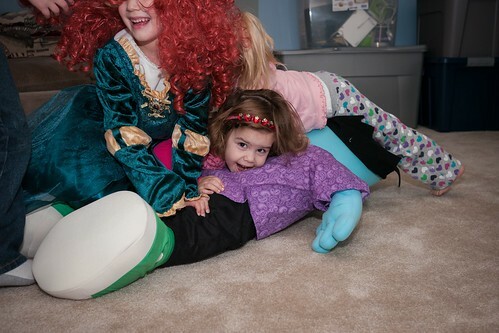 After sugaring up, all the kids had fun attacking the giant Frankenstein, though Leah looks to be too excited to participate. Aunt EA's boyfriend, Scott, brought the girls two pumpkins, so we took advantage of a hurricane day on Tuesday and carved them. 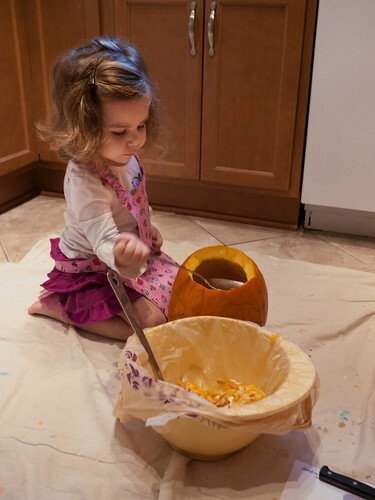 Leah was a bit more hesitant to get her hands (or spoon!) dirty to scoop out the seeds. 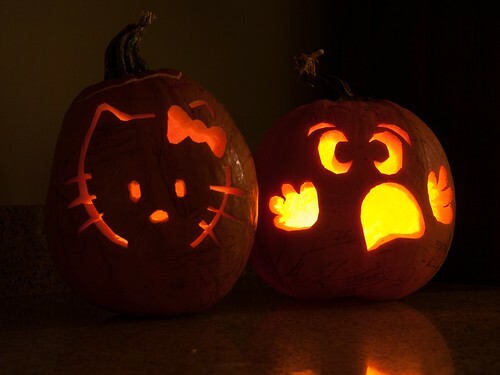 After the girls bailed on the pumpkin carving, I worked on their designs. Molly insisted on keeping them inside so the bugs wouldn't get them, so we had a few friends watching over our dinner.